By the end of the Yayoi period (Japan’s Iron Age) in 250 AD, there was probably an emperor in Japan. But the real power still lay with the rulers of many different city-states. The emperor couldn’t really tell them what to do. That stayed the same through the first part of the Yamato period, with many small wars among the city-states. Most people in Japan followed Shinto religion. There were many local gods for the many small states. The rulers kept on building earth burial mounds for themselves, which they called “kofun”. 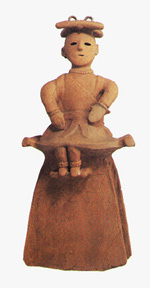 Often they put clay figures, or “haniwa”, in the mounds to help them in the afterlife. But there was already trade with China and the Silk Road. Beautiful glass bowls from the Roman Empire sometimes reached Japan. Possibly Japanese women began pearl-diving about this time, to sell pearls to these traders. Things changed about 550 AD, when the Yamato family succeeded in unifying Japan’s small city-states. For the first time, Japan was really one empire. One thing that helped the Yamato succeed was that they encouraged many people in Japan to convert to Buddhism, though people kept on visiting Shinto shrines too. The Yamato emperors encouraged many Chinese and Korean administrators to come help them out in Japan. These immigrants brought with them the Chinese written characters, using them to write even in Japanese. They also taught people in Japan to grow silk for finer clothing, to carve statues and build pagodas. They brought Chinese horses to Japan to form cavalry units for the Japanese army. What was China like at this time? What’s going on in Korea? About the same time, Japanese blacksmiths started to make steel in one-use clay furnaces. They probably learned how to forge steel from Central Asians via the Silk Road (maybe through Korea). Or they might have learned from Indian techniques traveling through South-East Asia to Japan by sea. But Japanese steel was not as high quality as Central Asian steel. By about 610 AD, people in Yamato Japan were making paper, too. The first Japanese emperor who’s probably more than just a story was Bidatsu. He ruled in the mid-500s AD. What else was going on in the 500s AD? He had four wives (not all at the same time). One of his wives was his half-sister, Suiko, and another wife was his sister, Nukate-hime. Bidatsu may have died of smallpox, which was just spreading across East Asia from India at that time. Two of his brothers ruled after him. They were probably killed by families that opposed Buddhism. And then in 593 AD Suiko took power. Like many later Japanese emperors and empresses, Suiko had advisers who were sometimes more powerful than she was. But Suiko also held power of her own, like many Eurasian woman about this time, from Ingundis in Spain and Brunhild in France, to Pulcheria in Constantinople and the Empress Wu in China. How did Empress Wu get power? Empress Suiko’s advisers, Prince Shotoku and Soga no Umako, were both from the powerful Soga family, which had a lot of power. Together, these rulers issued Japan’s first constitution in 604 AD. This constitution mainly insists that Japanese rulers and their helpers should be good, truthful, and helpful: “Administrators should make good behavior their leading principle,” and that they should work together: “Decisions on important matters should not be made by one person alone.” It’s pretty general, but it was the first Japanese statement that even the rulers were not above the law. Three years later, these rulers sent a message to the Chinese Sui Dynasty emperor Yangdi making it clear that Yamato Japan would no longer pay tribute to China, but considered the two empires to be equals (This shift in policy may be related to China’s invasion of Korea in 612). Now Japan would be independent of China. Need a second source on the Yamato period? Check out this article from the New World Encyclopedia, or the University of Pittsburgh’s summary and timeline. Cite this page: Carr, K.E. Yamato period – Early Medieval Japan. Quatr.us Study Guides, July 27, 2017. Web. April 19, 2019.